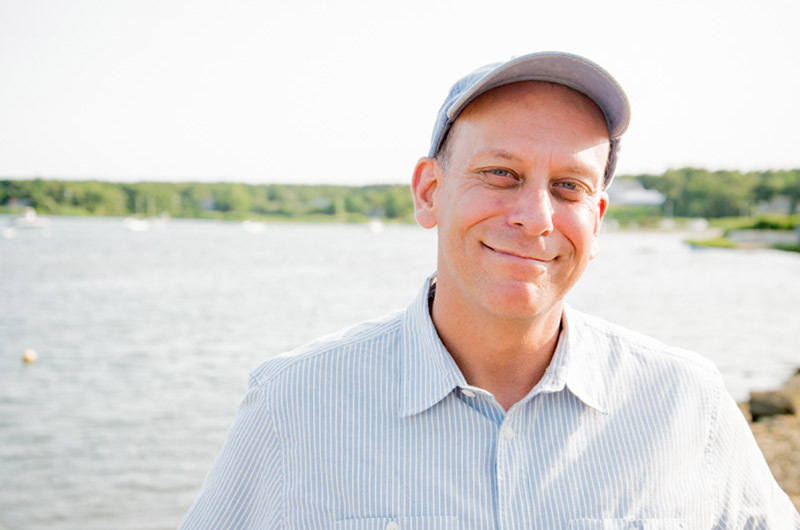 Author Paul Greenberg talked about state of fishing industry and his research into omega-3s. For a single evening last week, the Martha’s Vineyard Shipyard became an outdoor dining room with waterfront views to rival any on the Vineyard. A crowd of Islanders gathered on a gravel strip between the metal buildings and Lagoon Pond, away from the rushing traffic on Beach Road, for a slow-paced evening of food and conversation. 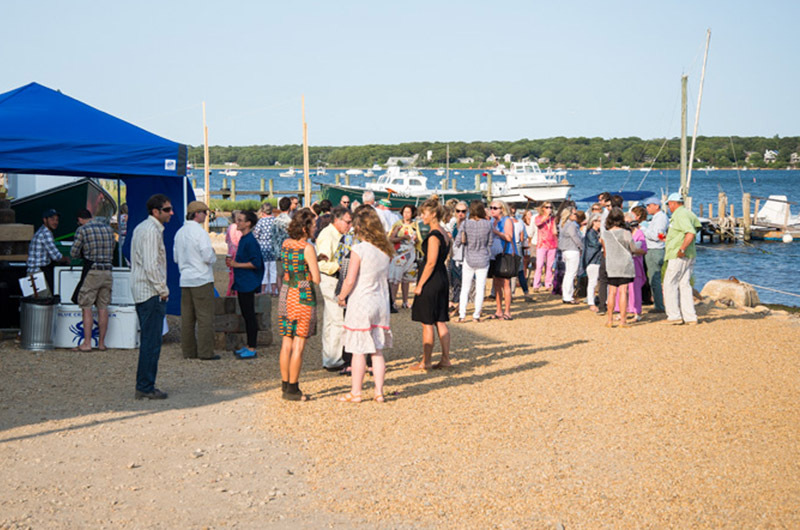 It was both a dining experience and an education, as visitors eventually moved into a cavernous shipyard building (complete with two sailboats perched on stands) for a conversation with author Paul Greenberg, whose most recent book, American Catch, explores the nation’s seafood industry. It was also the first time the historic shipyard, now in its 160th year, has been used for such an event, but it had all the right ingredients. The setting sun cast a shadow over the gravel, where strings of lightbulbs hung above wooden tables and people enjoyed a four-course meal by Blue Crab Kitchen. 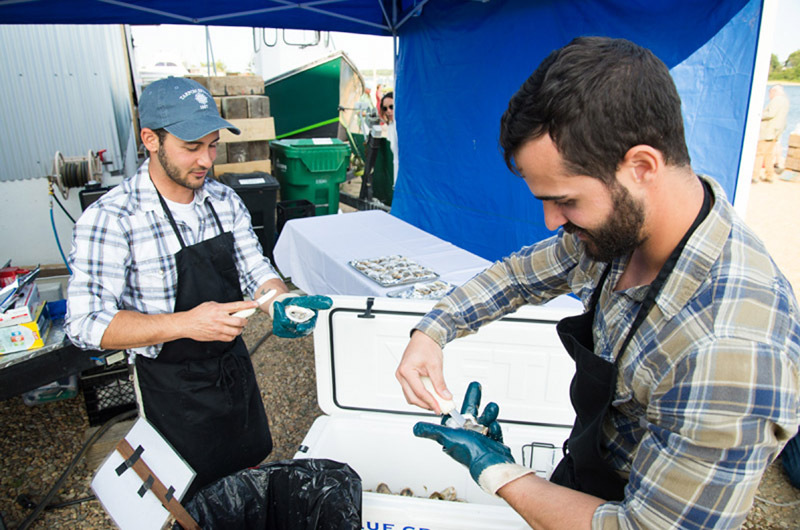 Dan and Greg Martino of Cottage City Oysters chatted with visitors and shucked oysters harvested just a short boat ride away in the outer harbor. Outdoors a lone shellfisherman waded ashore with his daily catch nestled in an inner tube. The pop-up culinary event was organized by Farm. Field. Sea. and kicked off the group’s new dining-education series Gather: The Culture of Food Explored. The series aims to explore the Island’s culinary landscape through food and conversations. “I find when you bring people somewhere unique, there is a great sense of engagement,” said Nevette Previd, who founded the group four years ago. Inside the shipyard building, with a swath of the Lagoon still visible through an open bay door, Gazette publisher Jane Seagrave spoke with Mr. Greenberg about the state of the industry and his current research into omega-3s, the popular fatty acids found in fish and plants that are thought to improve cardiovascular health. Americans tend not to eat fish with a strong flavor, Mr. Greenberg said, and shrimp makes up the largest portion of U.S. seafood imports. But America’s taste in seafood has a dark side, since a portion of imported shrimp depends on slave labor, as chronicled by the Associated Press in its Pulitzer Prize-winning series last year. Mr. Greenberg remains skeptical about the health benefits of omega-3s. But he has taken his research to heart, so to speak, by cutting out all land-based meat from his diet. His heart rate, cholesterol levels and weight have all gone down, he said, although he noted that all diets tend to make you healthier. The conversation drifted to aquaculture, which means different things to different people. More seafood is now farmed than caught, Mr. Greenberg said. Martha’s Vineyard Shellfish Group director Rick Karney, along with Mike Holtham of Menemsha Fish House and charter captain Buddy Vanderhoop, joined a panel discussion that touched on aquaculture, overfishing and consumer education. “All aquaculture is not the same,” said Mr. Karney, who founded the shellfish group hatchery in the 1970s to support Island fisheries. When declining offshore stocks displaced many Island fishermen in the 1990s, he used federal funds to help them transition to aquaculture. Vineyard oysters are now a thriving industry, although people often oppose new farms in their neighborhoods. 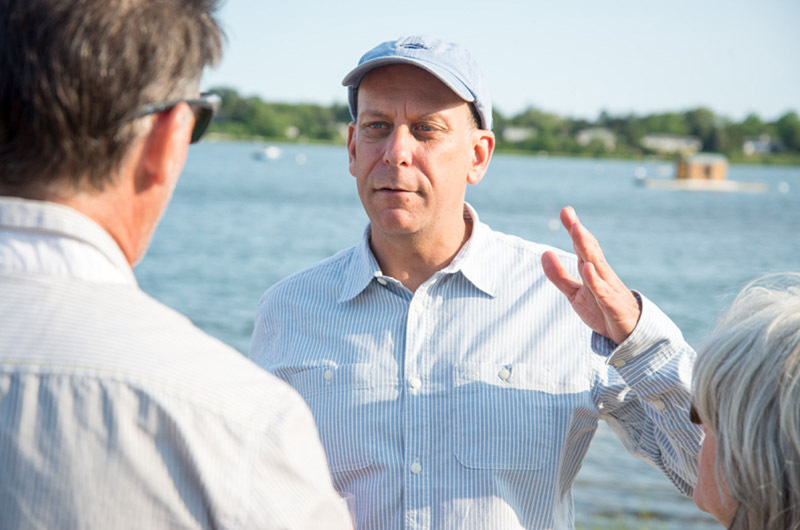 Mr. Vanderhoop is working with oceanographer Sylvia Earle, filmmaker Bob Nixon (owner of the Home Port restaurant in Chilmark) and others to create marine sanctuaries in the waters south of the Vineyard. Mr. Holtham said he supports local fishermen by purchasing their products and using as much of the fish as possible. Even the remains are used to bait lobster traps. He has seen big strides in consumer education, with many seafood products now arriving with information about their source, and even identifying the boat and captain. Some of that information ends up on restaurant menus. Following the discussion, people settled in at the tables outside and an orange moon rose above the water. The meal put theory into practice, with local ingredients from Menemsha Fish House, Thimble Farm, Morning Glory Farm and Cottage City Oysters. A portion of the proceeds also benefitted the shellfish group.